ENERGY STAR is a U.S. Environmental Protection Agency (EPA) voluntary program that helps businesses and individuals save money and protect our climate through superior energy efficiency. ENERGY STAR is an influential brand that is recognized by over 85% of Americans nationwide. Products that earn the ENERGY STAR prevent greenhouse gas emissions by meeting strict energy efficiency guidelines. Brand owners that certify their products to meet ENERGY STAR requirements may use the label as a tool to educate their customers about the enhanced value of these products. There are currently more than 45,000 third-party certified ENERGY STAR product models from more than 1,800 brand owners listed at data.energystar.gov. These products include appliances, commercial food service equipment, electronics and office equipment, heating and cooling products, lighting and fans, and home building materials. A full list of ENERGY STAR product specifications include information on eligible product types, product performance criteria, and partner commitments. The 40 data sets available at data.energystar.gov are also available for developers via SODA API using the Socrata Platform. These data sets represent a broad range of product categories and include detailed information by model number about product performance, including energy use and efficiency. EPA encourages energy efficiency programs, retailers, and developers to use the APIs to pull current data on ENERGY STAR products and help promote products that have earned the ENERGY STAR. ENERGY STAR is a registered trademark owned by the U.S. Environmental Protection Agency (EPA). Consumers recognize and trust the ENERGY STAR logo to represent energy-efficient products that meet certain performance standards. EPA maintains the trademark’s integrity by allowing access to the logo on an entity-specific basis, and in association with ENERGY STAR certified models only. Please contact Kathleen Vokes at vokes.kathleen@epa.gov for permission to associate the ENERGY STAR certification mark with products listed on the currently certified product APIs available at data.energystar.gov. EPA periodically revises specifications for ENERGY STAR products to keep pace with the evolution among leading products and continue to effectively differentiate efficient products for consumers. To ensure that you have information on planned updates to data sets driven by specification changes, EPA will follow a standard deprecation process for changing out data sets as described in the flowchart below. 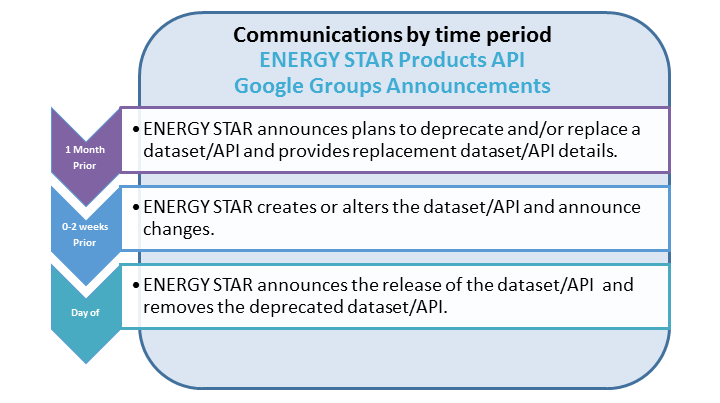 For general API support or comments, please join the Google Group ENERGY STAR Products API.